Note from shop owner Hey there! FairyFlux will be back in business on Tuesday. April 30th. All current orders of in stock items will ship out as usual. Hey there! FairyFlux will be back in business on Tuesday. April 30th. All current orders of in stock items will ship out as usual. 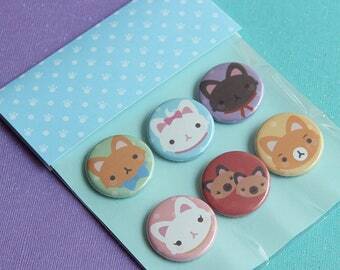 Another button set has dropped featuring the cats from Disney’s Aristocats! 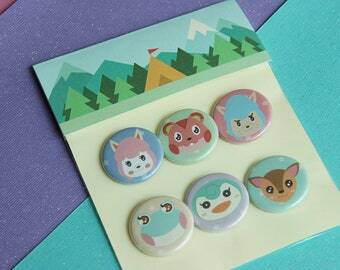 Animal Crossing pinback button set has arrived in the FairyFlux store! Currently designing new FairyFlux business cards. 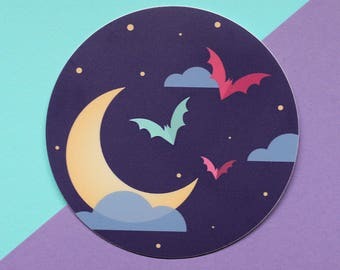 You can find this bat motif everywhere in my store, like the stickers and packaging! My workspace is wherever my laptop can fit! FairyFlux is a movement for individuals who dream of worlds unlike our own. Hi there! My name is Cathy and I'm the owner of FairyFlux. I graduated with a BFA in Graphic Design but slowly realized I loved designing things for me instead of clients. Over the years I interned at various places while working at my father's business. From there, I learned how hard (but rewarding) running a small business was and it drove me to create FairyFlux. I taught myself how to sew several years ago via YouTube videos and books. Cosplay is a major hobby of mine and I'm constantly improving my skills. Adobe Illustrator is one of my favorite programs and vector art was my strength in art school. One of my hopes is to expand my line of enamel pins, stickers and other adorably designed merchandise. My overall aesthetic = juxtaposition. Hard and soft. Cute and crass. Dark and light. I love mixing things that don't normally go together. I also have a penchant for "scary" monsters like Ultralisks, Xenomorphs and Godzilla. They print and cut my stickers for me! Pin orders will be shipped via First Class Package - USPS with tracking information. All pins are placed in a clear cellophane bags and bubble-wrapped. All sticker orders will be shipped via First Class Letter - USPS without tracking but should reach most U.S. addresses in 1-3 days. Stickers will be encased in clear cellophane bags and cardboard sleeves. All orders can be upgraded to Priority Mail if needed. Message me for more information or pricing questions. If you have received a damaged item, please message me immediately! I will require a photo of the item before I ship a replacement out. Why didn't I receive a paper invoice? To be more eco-friendly, paper invoices are not normally included in your order since a digital one is readily available. Message me if you would like to receive a paper copy of your invoice. Anything marked "seconds sale" is final sale. Sorry, no refunds or exchanges allowed! By placing an order, you're acknowledging the defective nature of the item. Seconds sale items are chosen at random and may have slight imperfections.